Our minds are so incredible, but sometimes, it seems like our minds are our worst enemies. We get overwhelmed with limiting beliefs, stress, unhappiness, negative feelings etc. and sometimes it feels near impossible to shake that negativity off and make our way back to where we’re feeling positive, curious, peaceful, creative and happy. 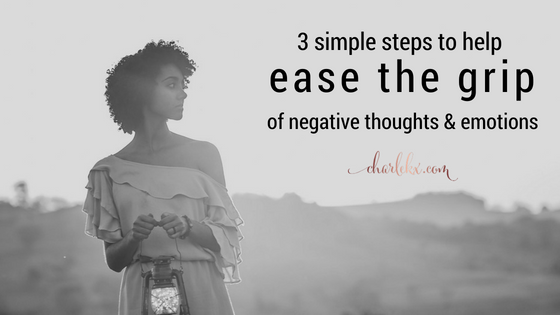 When you begin to feel an onslaught of negativity, here are three simple steps you can use to help ease the grip of negative thoughts and emotions. 1.) Notice. Observe and identify your negative feelings and try to figure out what triggered them. 2.) Say thank you. Thank them for being there for you in the past and protecting you when you needed it. 3.) Bid them adieu. Say goodbye to those feelings and thoughts because you are working your way to wholeness and they are not longer serving you. Try and remember not to believe everything you think and feel. At one point these ways of thinking and feeling were essential to your survival but now some of those strategies do not work anymore. So be an observer to yourself and let go of the ways of being that no longer work for you and that no longer serve you. This will take practice but it will be so good for you.